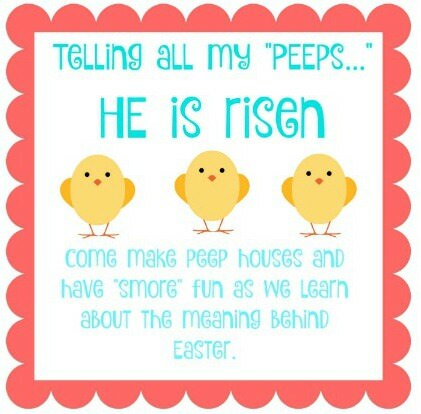 Hey “Peeps” I am excited to share my Peeps Party with you today. I love having “s’more” fun with holidays and finding ways to incorporate the fun stuff with the real reason for the season. Easter is fast approaching but it is not too late to have fun with your kids and teach them about Christ’s resurrection. 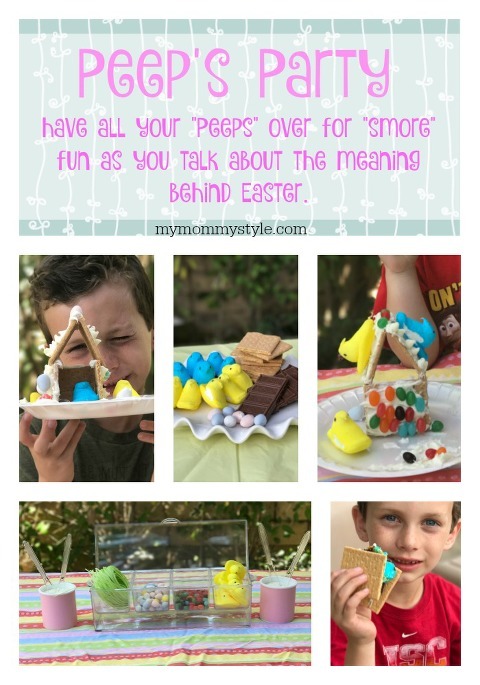 Below I will show you how to make Peep houses, Peep s’mores, a lesson on Christ resurrection, and include an invitation to give, text, or email friends. It would be rude of us not to share the fun with our neighbors and friends right? 😉 In all seriousness, I find a way I can serve my Lord is by not only teaching my kids about the Savior, but teaching others as well. No one will be offended to be invited to a Peeps Party, So don’t hesitate “Peeps” and go out there and invite others to the fun. to get the printable invitation above click HERE. I recommend printing it on cards stock if you plan on handing them out to friends and neighbors. For this party, I just hot glued the houses together using 3 squares. Next I made the roofs separate. The kids ate so much candy in between decorating that they didn’t care to eat the houses after. However if you want it ALL edible then use hot sugar or royal icing to build your houses. Make sure to not attach the roofs until after so the kids can fit their chicks in their home. Using the candy, let your kids go to town having fun decorating. Warning this can be messy and loads of fun so if your not interested in fun then stop now and move to the next part of the party… (which is also fun). After we were done with our Peep houses we moved onto our lesson. To bribe them to sit still we said they couldn’t move onto the s’more part until we were done. The lesson on the resurrection of our Savior Jesus Christ is adapted from HERE. You can make it as long or short of a lesson as you want but I suggest using printing and using the images attached in the lesson. My kids loved taking turns teaching the lesson using the pictures. The Lesson HERE is great and I recommend just adjusting it to work for you and your kids ages. Next up we did the Peep S’mores and boy are those little critters good when the sugar is all caramelized. mmmmm!! If you need to grab some new roasting sticks, don’t forget!